Board certified by the American Board of Plastic Surgery, member the American Society of Plastic Surgery and American Society for Aesthetic Plastic Surgery. Dr. Jeffrey Williams was born and raised in Ft. Wayne, Indiana. He attended Indiana University where he graduated Phi Beta Kappa. He also attended the Indiana University School of Medicine. He completed a five-year general surgery residency at St. John Hospital & Medical Center in Detroit where he was introduced to the field of plastic surgery by Dr. W. Peter McCabe. He then went to Houston Texas for his plastic surgery residency at Sisters of Charity, St. Joseph Hospital, including University of Texas M.D. Anderson Cancer Center. 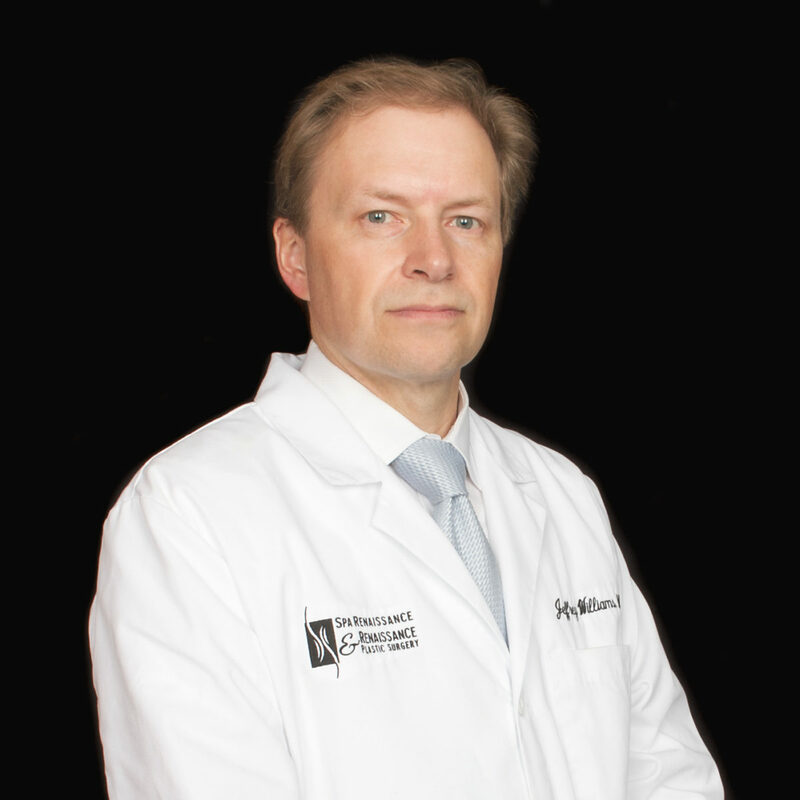 Over the years Dr. Jeffrey Williams has been voted “Top Doc” several times by Hour Detroit Magazine and Castle Connelly as one of the top surgeons performing aesthetic and reconstructive surgery today. He is a member of the American Medical Society, Michigan State Medical Society and holds privileges in Michigan’s top-ranked hospitals. Out-patient surgery performed by Dr. Stefani at Beaumont Troy, for osteoma (two bony bumps) removal on forehead. Care was top-notch. Had post-surgery swelling around eyes over the weekend. Called the after-hours service. Dr. Williams called back within minutes and reassured me that the swelling was due to normal fluid flow, expected to peak at 48-72 hrs and not a result of infection (my main concern). Swelling subsided after two-days of cold compress as advised. Dressing was removed a week later. Osteomas are gone, incision looks clean. My services at Spa Renaissance & RPS are always great. I've been coming here for years and it's always a great experience! Ana Maria had a breast reduction and liposuction with Dr. Williams, she also sees Maureen for injectables! I love love love Dr. Williams and Maureen. They are both amazing! Mary has had ActiveFX (laser skin resurfacing), Liposuction, rhytidectomy (facelift) and a brow lift with Dr. Williams, she also sees Maureen for injectables! I have been a customer at Spa Renaissance & RPS for years, it's always a great experience! Katie had Liposuction and Breast Reduction with Dr. Williams, she also sees Maureen and Alyssa in the spa. Dr. Williams: We are so thankful for the wonderful care you and everyone in your office provided throughout my breast reconstruction. Sanela was always so patient and kind - especially since I am such a baby! Patricia was so knowledgeable and willing to answer my phoned in questions. Your skilled hands worked miracles and the end result is truly amazing! Thanks again for your support and kindness! Sheri had breast reconstruction surgery with Dr. Williams. Excellent first visit following a breast cancer diagnosis. The staff members (Patricia, Donna, Michelle, and Sanela) were kind, compassionate, and knowledgeable. Michelle took extra time with me sharing pictures and models for reconstruction. She was very personable and answered questions until I felt comfortable with my decision. Dr. Williams is a brilliantly skilled surgeon. He was so patient, supportive, and he explained options very clearly. I felt more relaxed after meeting him and seeing first hand how much he truly cares about his patients. Spa Renaissance made a difficult time in my life a bit brighter! Thank you so much! Dr. Williams and his staff are very helpful in managing breast cancer, I am very satisfied!! I see Dr. Williams at Spa Renaissance & RPS. Dr. Williams & the entire staff are amazing! The ladies at the salon & spa are also very professional, personable & educated on the products. I definitely recommend Dr. Williams & Spa Renaissance.